In this online world, peoples are using an online booking system for the variety of task. Instead of standing queue and buying tickets is simply a waste of time and energy. Phpscriptsmall developed Responsive Events Movie Ticket Booking Script which allows peoples to book tickets online for cinemas, and events at anywhere and anytime. The entrepreneurs and theatre owners can make use of our online booking script and earn high revenue from the business. This script helps to manage movies, event details, show time and ticket rate. The user needs to provide a valid username and password to enter into the booking script, and can search for the movies, events, and cinema by using date and city option. After selecting the movie, the show time and seating availability status in the popup. The user can select the number of seats and pick seats from the seating layout. The visitor needs to book the ticket with the registered member and guest user. After the selection, the customer can pay tickets amounts through online. The payment process in our Events and Movie Ticket Booking Script will be safer and secure manner. On the right side of the admin dashboard consists of the total number of theatres, now playing movies, upcoming movies, Events, and archive movies. In the bottom of the admin panel has booking opened movies and events, theatre admin, registered users, and news. The admin can take different types of reports such as movie, seating and events reports. 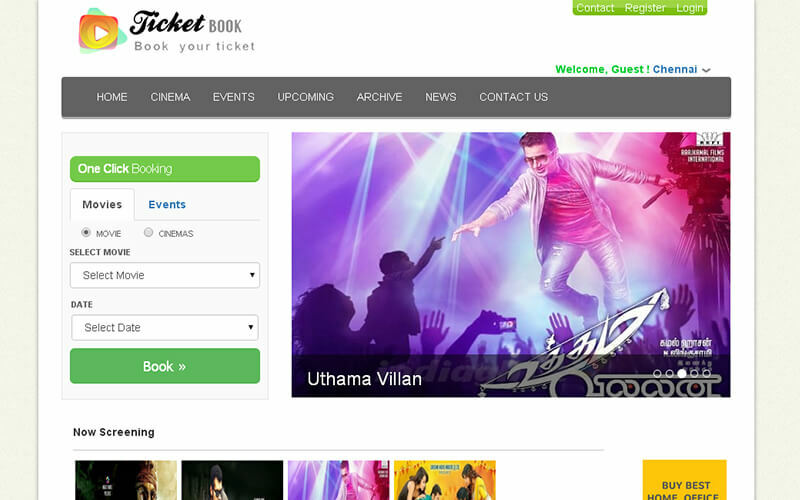 Without ant technical skills the admin setup and manage the Events and Movie Ticket Booking Script easily. The main features of our Online Ticket Reservation Script are simple registration process, advanced search option for movies & events, secure payment gateway, movie management, event management, attractive user interface, archive management, advanced booking system, news management, high speed and performance, powerful admin dashboard, secure code, seat blocking management, and many more. The revenue models of the online ticket booking script are Google Ad sense, Banner advertisement, and commission model. The important advantages of our Responsive Events and Movie Ticket Booking Script are mobile responsive and SEO optimized. The script is developed in PHP and MySQL with 100% open source code. The customization of our event and movie reservation script is possible according to the client business strategy and goals. We provide 1-year technical support, 6 month free updates of the source code and brand free ticket booking website. After purchasing the script the site will be live within 24 hours. This is a good script with nice design quality. The offers provided by the company are wonderful and I got profited so much. It is at affordable price and the developers are talented and cooperative. They are available 24*7. I personally like this script so much. Few months ago I bought this script. It was everything works done, well documentation and a lot more. Support was great too. Nice work. They are always available to answer questions, make improvements and provide guidance for your project. I will sure use them for all my upcoming projects and recommend them! !